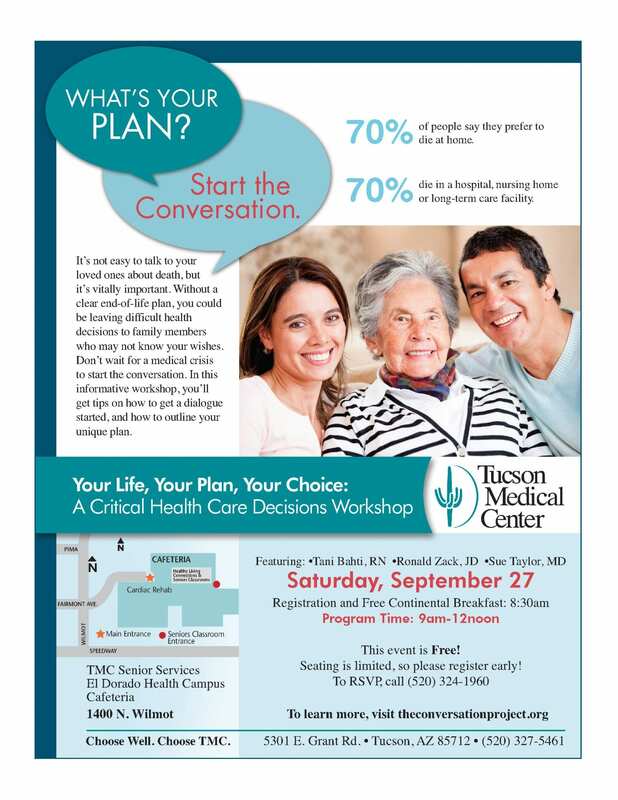 DMYL attorney, Ronald Zack, will be presenting at Tucson Medical Center’s workshop, Your Life, Your Plan, Your Choice this Saturday, September 27. Many people find it difficult to talk about death. But not having this conversation with your friends and family can force them to make decisions regarding your care that you may not approve. This informative workshop aims at providing tips on how to get a dialogue started and help build a foundation for a plan in the event you are not able to advocate for yourself. The program stems from a national initiative to encourage and educate people to openly speak about their end-of-life care wishes. This one conversation can make a world of difference in your life and in the lives of those you love. Ronald Zack, an advocate for this initiative, will be presenting an overview of the Arizona law that impacts your directives. He will also be participating in the program’s Q&A panel discussion. Attorney Ronald Zack is a DMYL Shareholder. His legal focus is Elder Law, Estate Planning and Probate. In addition to his Juris Doctorate degree, Ron earned a Master of Arts degree in Linguistics and a Master of Science degree in Nursing Education. He maintains his nursing license and has extensive experience in Hospice and Paliative nursing. Currently, he is vice president of the Arizona Gerontological Nurses Association and serves on the Boards of Pima Council on Aging, the Pima County Bar Association and the ethics committee of a local hospice. 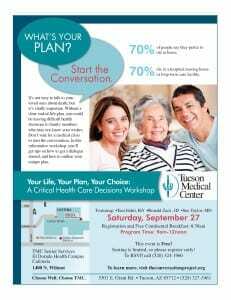 DMYL invites you to attend this TMC community workshop on Saturday, September 27 from 9am-12pm. The program is free and will be held at the TMC Senior Services El Dorado Health Campus located at 1400 N. Wilmot Rd., Tucson. Seating is limited, so reserve your seat by calling (520) 324-1960.